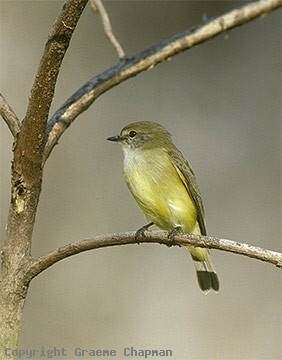 Lemon-bellied Flycatchers are closely related to the Jacky Winter. They occur only in tropical northern Australia, south to about St Lawrence in the east and to near Broome in W.A. where the race "tormenti" inhabits mangroves (see under Brown-tailed Flycatcher). 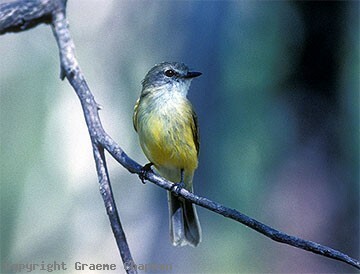 In contrast to the Jacky Winter which prefers drier more open woodland areas in northern Australia, the Lemon-bellied Flycatcher inhabits more humid environs such as riverside vegetation, mangroves, edges of rainforest and coastal forest, although there are some places where they occur side by side. The two species are very similar in habits and feed by sallying forth both into the air and to the ground from a lookout perch. They both have aerial display flights and are both accomplished mimics. Lemon-bellied Flycatchers build a very small nest, even smaller than the Jacky Winter (see pic 3777210), but the honours for building the smallest nest in Australia go to the Brown-tailed Flycatcher from the mangroves of the Kimberley Division of W.A. which is now regarded as a plain coloured subspecies of the Lemon-bellied. Their nest is so small that it is almost invisible from below, barely wider than the small branch it is built on. 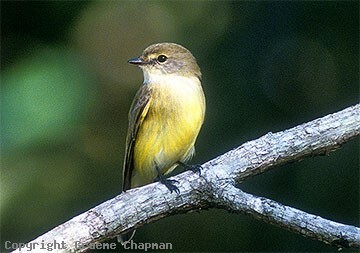 Lemon-bellied Flycatchers are also one of the few passerines in Australia to lay only one egg, possibly because that's all that will fit in the nest! Details of their life history are fairly well known thanks to a colour-banding study carried out in Darwin by Dr Richard Noske. An interesting summary of that study was published in WINGSPAN magazine Vol 21 No 4 in 2011. 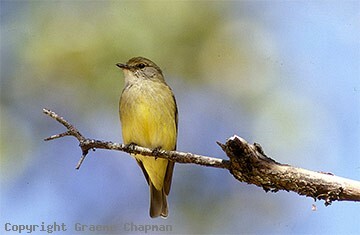 379201 ... Lemon-bellied Flycatcher, Jourama Falls, Queensland.